The Edge can be seen using the hw AC30 in many videos...!!! Miles used a Vox AC30 HW in The Rascals. For his solo career this amp is mainly used for the Keys. 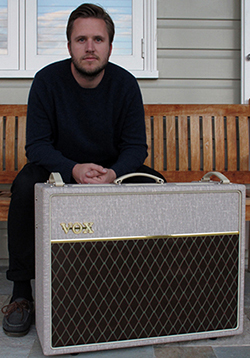 According to his "gear list", Robertson uses the Vox AC30 Handwired guitar combo amplifier. Talking about his amp setup at 4:49, "They're both hand-wired AC30s. They are Tolexed in bronco red because all our amps are Tolexed in bronco red right now. I use those because they're new and I think I've had one go down on me in the last six years." "The VOX AC30 is a classic amp and I used one a lot during the recording of my Dead Peasants record, and once I did some touring for that album, I started to see how that sound could apply to what I do in the Foos. I’m running two in stereo for my hot tone live and it’s pretty ripping. I’ve got those things pinned." "I just like the distortion you get from driving an AC30 really hot. It’s nice and dirty but you can still hear the definition and notes. My Hand-Wired VOX AC30s are the tone that I’ve been looking for, for a long, long time. They give me all the fireworks, but all the subtlety as well!" In this photo posted by Vox Amplification to Instagram, Billy Duffy can be seen playing through his Vox Hand-Wired AC30HW2 combo amp. At 3:18 you can see a vox AC30 handwired. At 7:00 in this Angel & Airwaves show, David Kennedy's Vox AC30 hand wired amp can be seen. At 0:28 in this video of Hozier performing "Work Song," his Vox AC30 can be seen. The other half of Rosamilia's amp equation is a Vox Hand-Wired series AC30. Each amp sports a pair of Weber Blue Dogs. He runs the JMP dry and pipes delays and other swirly effects through the AC30. Rosamilia carries vintage backups for each amp: a small 1967 Marshall PA-20 head and 1962 Vox AC30 loaded with Celestion Blue 12" speakers. Here at 6:29 you can see the Hand Wired Vox AC-30 behind Dom. 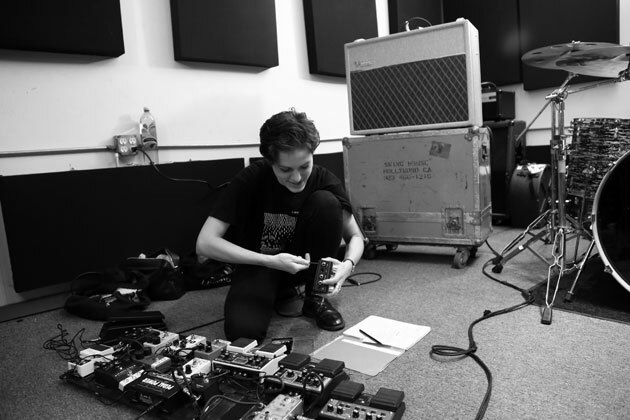 In this [interview with *Premier Guitar* magazine](http://www.premierguitar.com/articles/23617-sonic-savage-gemma-thompson?page=3), Thompson explains that she uses an AC-30HW2X because she prefers vintage sounds, and feels it best approximates older Vox units. "It’s the handwired reissue with the Celestion Blue alnico speakers," she says. 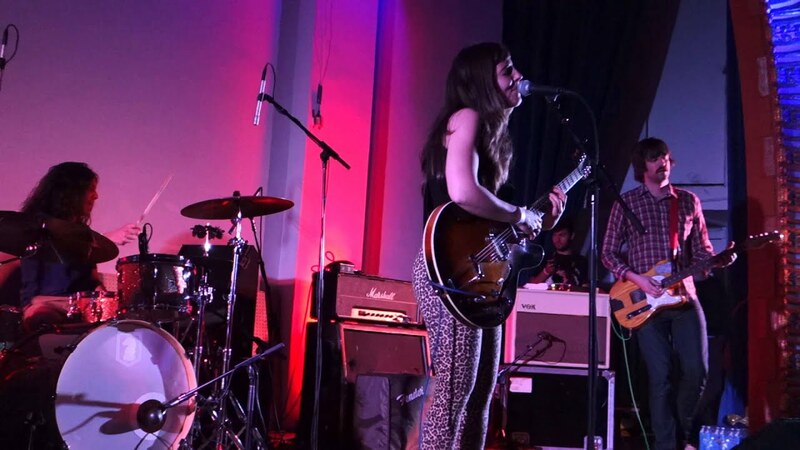 "It’s the closest modern Vox AC-30 I’ve found to the original sound of the ’60s ones." You can see them I may have chosen the wrong hand-wired AC30, the selections were complicated, I believe this is the right one though..
Jan can be seen playing the Vox AC30HW in this video. In this photo, Gavin is visible with Vox AC30HW amp. "Pretty much… although I did use a Les Paul and Telecaster on this album to get some different sounds and a Vox AC-30HW2X." Seen at 13:21 in this rig rundown interview. In this photo, one can see Marin configuring his hand-wired AC30. According to Premier Guitar, Vaden uses the Vox AC30HW2 amplifier. In the back the Vox V30 Hand Wired can be seen. I like everything about this amp. I don't miss the vib/trem channel, the bright switch on the normal channel brings the non-top-boost JMI brilliant channel sounds and the 'hot switch on the top boost channel is to die for. The master volume is pretty useable and the half-power switch is a huge help in these days of stage volume restrictions. What a well-though-out take on the classic design. Did I mention the gorgeous fawn Nubtex? Even the stock greenbacks sounded pretty solid, but she really came alive when I installed a G12 blue and an H30 55hz clone. That pair of speakers really makes for a larger than life vox tone, clean or dirty. Awesome amp, some slight modding needed. Have absolutely loved this amplifier. Had some minor issues with unwanted buzz with bad power supplies in live applications. Found out that there was an issue with the resistor placements on the grid, but once we fixed that there were very few issues! LOVE THIS AMP! Will update this soon, but i played one awhile back fell in love so i decided to buy one sight unseen. I've gone through so many AC30c2 (and the CC2 and the AC30vr) that i decided to try this one. I'm stoked to hear the sounds. Its night and day compared to a Chinese AC30. A little brighter, tighter and punchier than my 1962 ac30, but very close. You will never part with this amp. Vox nailed it this time. If you got the version with greenbacks consider replacing them with Blues (weber blue dogs will do, though I prefer the Celestion RIs once they break in). The greenbacks sound good but get a bit mushy. This amp is also loaded with useful features that don't bog the circuit down. Hot mode is a blast! And this amp is just beautiful to behold, isn't it? I've recently bought one of these amps and they're just perfect. Sparkling Cleans. mine holds up to my vintage ones.... I really like the ac30 for its dirt though, dunno why everyone is so obsessed with the clean sound because there isn't much of it at stage levels, its subtley dirting up right away on any stage where you're not asked to be a tinny whisper under the drums. in half power there's almost no headroom on the reissue.... my '63 really has no headroom. There just isn't a truly clean sound but the sounds it makes are clorious. but congrats. This is vox's best amp in years. I am dying to try the new EF86 versions they released at NAMM. Kinda weird that this one has the fawn tolex from the EF86 preamp era while the new ones with the older preamp have transitional smooth black tolex.... and then only the funk custom classics get black basketweave nubtex. Vox is a mystery these days.